The Axo Hand is Brink Bionics flagship technology. The Axo Hand is a six degree of freedom myo-electric hand prosthesis, designed for adults with below-elbow limb differences. It has been developed in the Engineering Bionics Lab at the University of Waterloo. 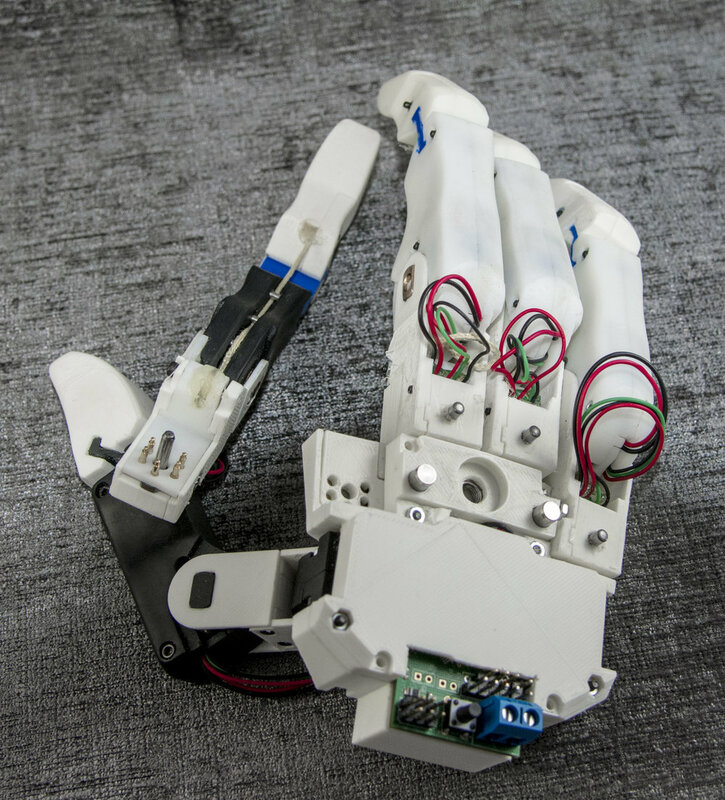 Our goal has been to build a low cost robotic hand that can provide many of the same functionalities that the top myo-electric hands offer, while also offering meaningful capabilities that the leading devices do not provide. Myo-electric prosthetics need regular maintenance and upkeep. When parts wear out, users must send their devices to the manufacturer for repairs and will often wait months before getting them back. We aim to give prosthetic users more independence, which is why the Axo Hand uses our patent pending Re-Link system. Re-Link allows the user or clinician to swap out modules in the hand to replace damaged motors, sensors and mechanical drive components quickly, safely, and easily. 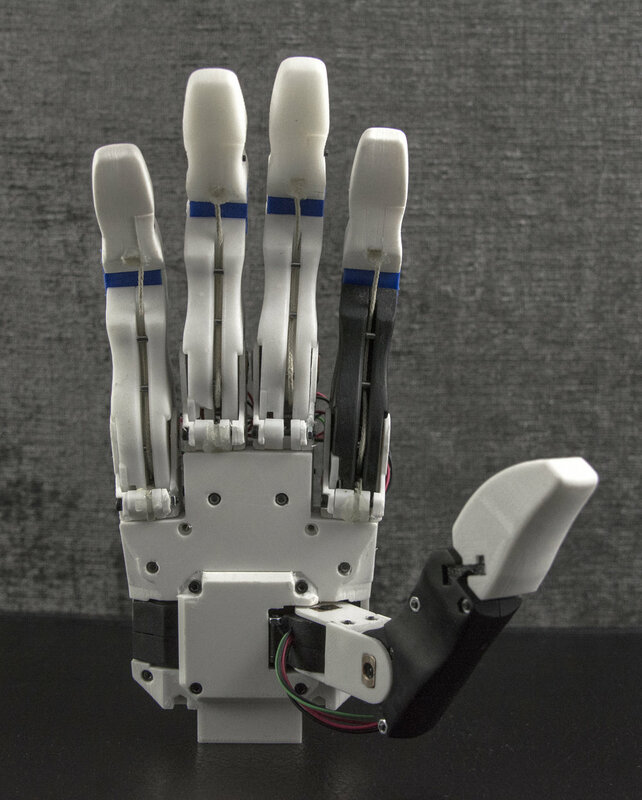 Some companies are using 3D printing to make low cost robotic prosthetic hands. This manufacturing method works if a company is making hands for a few people, or for pediatrics. However, this is ultimately impractical and slow when producing large volumes of robotic hands. We wanted to offer adults with limb differences low cost prosthetic hands without using cheaper materials or slow production processes like 3D printing. That is why the commercial version of the Axo Hand will be constructed using high quality injection molded polymers and precision machined metal components, just like the most advanced available prosthetic hands. Current advanced robotic prosthetics use control methods that haven't changed much since the 1960s. It's time for a leap in innovation. Our team members have developed life changing control systems for upper limb prosthetics in their research careers, and they are bringing these skills and innovations to Brink Bionics. We are developing state-of-the-art machine learning algorithms that will allow people with limb differences to control the Axo Hand the same way they would control their natural limbs. Do you have questions for us? Contact us for more information on our cutting edge technology.